The Ultimate Granola Bar [Vegan, Gluten-free] | EmmaEats…and Katie too! What’s it like in your household? Are you snackers or is there one among you? Katie certainly is. When she’s on the move, which is always, she’s happiest when she has something delectable within easy reach. Emma loves to feel prepared for anything and so, in addition to tissues, hand sanitizer, spare books, an extra pencil and eraser, she often has a snack (or two!) in her school bag to enjoy during recesses. All this snacking means it is especially important to have a good variety to keep things interesting. Granola bars have been a huge favourite in our household for years. I started really enjoying them during my pregnancy with Emma and they’ve been a staple ever since. The granola bars we usually eat are sweet hearty treats filled with pumpkin seeds, cranberries, sunflower seeds and chocolate. Although we all love them, it’s nice to have a little variety. That’s where these easy gems come in. These wildly delicious granola bars require a little extra attention while toasting the oats and coconut but the extra effort pays off with added depth of flavour. They are sweetened with dates and maple syrup and are gluten-free and vegan. No refined sugar, no gluten, no animal products, no problem. They are huge on taste. The ultimate granola bar which doesn’t make you feel like you’re missing out on anything. Spread the oats and coconut evenly over a baking sheet and toast in the oven for approximately 10 minutes, stirring once or twice over the duration. Remove from oven and let cool slightly. Line an 8″ x 8″ square pan with parchment paper. In a large bowl, whisk together the oat/coconut mixture with the chopped dates, ground flaxseed, chocolate chips, cinnamon and salt. After the dates are broken up and not sticking together in one big bunch, stir in the maple syrup, coconut oil and vanilla. Using a silicon spatula, press the mixture evenly into the base of the prepared pan. Bake for 20-25 minutes until the edges are slightly golden. Remove from oven and let cool completely in pan before cutting. Be sure to use room temperature maple syrup in the recipe. If you mix cold maple syrup with the melted coconut oil, the oil will solidify. Note: although I received a package of Baby Brain Organics Buddha Belly, the opinions expressed and the use of the product in this recipe were all my own. I did not receive any compensation for this post. This post was shared on Foodie Friends Fridays – Snack Food Linky Party. I love granola bars! Thanks for sharing on Foodie Friends Friday! Thank you Catherine, for popping by. They are indeed easy to make and I’d love to hear how they work out for you if you give them a try! Hello! 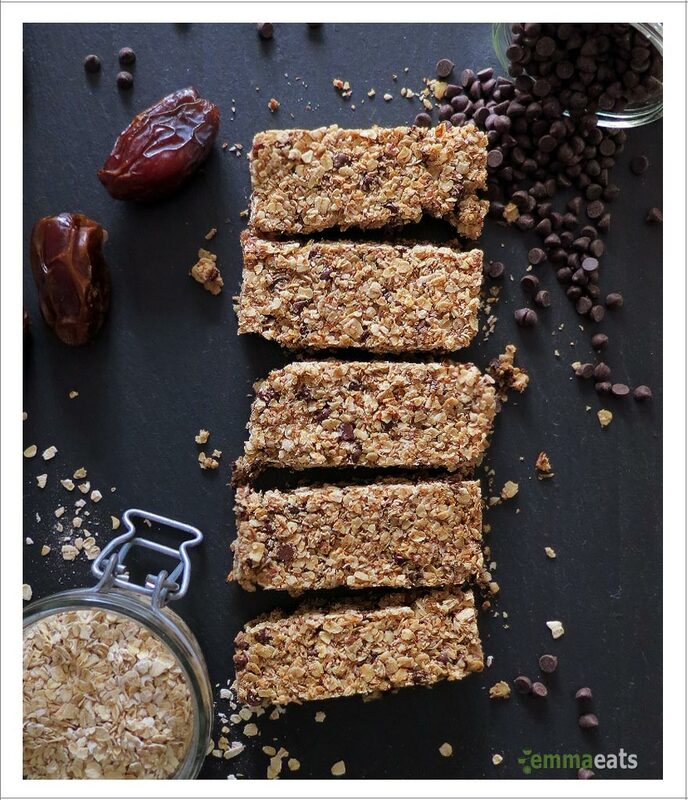 Great recipe – could you tell me the nutritional value per bar? Or your estimation? Thank you! Thanks so much for visiting. Although I didn’t originally calculate the specific nutritional value of these bars, I noticed there are a few online calculators out there. After plugging in the ingredients on the Recipe Calculator on SparkRecipes and one on caloriecount.about.com, one bar is ~220 calories and ~9g fat. You may want to try one of the calculators yourself on a recipe you’re familiar with to see which one you prefer.